In January, the top five were as follows: Maruti Suzuki (139,440 and 49.8% market share), Hyundai (45,803 and 16.4%), Mahindra & Mahindra (22,399 and 8.0%), Honda (18,261 and 6.5%) and Tata (17,826 and 6.4%). Honda was not only the star performer, its retail sales rising by 23.1% thanks to the latest generation Amaze, but securing fourth place was one position up on where it ended 2018. Tata, pushed into fifth last month, saw its best selling Tiago model suffer a sales dip of 3.0% to 8,041 units, with the Nexon (5,095 and +3.5%) the only other one of its vehicles to be inside the top twenty. The new Harrier, production of which is now ramping up, managed 422 deliveries. This SUV should greatly help the Tata brand in the coming months. Mahindra also has high hopes for its newest SUV, the XUV300 having been revealed at a media preview earlier on 14 February. The B segment SUV, formerly known by its S201 codename, is derived from the SsangYong Tivoli, the front and rear ends having been modified. M&M has taken its time to integrate the product lines of the Mahinda and SsangYong brands but it's now upping the pace. The Alturas G4, another new model, has been assembled from Korea-manufactured kits at a plant in Chakan since the final quarter of last year. The big ladder-frame SUV is a slightly modified SsangYong Rexton G4. The XUV300 is offered from launch with the choice of two turbocharged engines, pricing for the 1.2-litre three-cylinder petrol variants starting at Rs 7.90 lakh and Rs 8.49 lakh for the 1.5-litre four-cylinder diesels. That puts it in direct competition with the Maruti Vitara Brezza, Tata Nexon and Ford EcoSport among others. 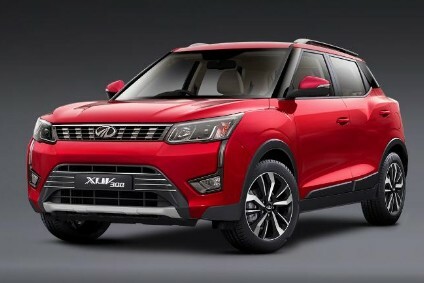 OEMs operating in India speak of 'bookings' for new models, with M&M claiming it already has 4,000 customers ready to take delivery of an XUV300. Mahindra is emphasising the safety aspects of the new model in its launch publicity, knowing that the public is increasingly concerned about the crash worthiness of vehicles in general. The XUV300 has seven airbags, separate head restraints including three in the rear, ABS, ESP and EBD - features which are not necessarily the norm for affordable cars in India.